Everything went well at the doctor today. 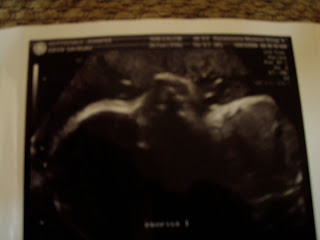 The ultrasound showed that Avery is measuring small -- she's 3 lbs 6 oz; 4 lbs is normal, but still within the normal range. She is small overall, not just 'skinny' ... I'm not exactly sure what that means, but I know that problems can arise if only the stomach measures smaller than normal. Fortunately, we don't have to worry about this. We saw her kidneys, bladder, and all 4 chambers of her heart ... everything looks good. We caught a glimpse of her face and a little yawn right at the beginning of the ultrasound. However, she promptly curled up into a ball, covered her face with her arms and put her feet on her head. So, we didn't really get any good pictures this time. I’ve included a sonogram picture below, but you can really only see her forehead (on the left) and the blur of her arms/legs (in the middle). She is currently breech, so we're hoping she flips in the next few weeks. But, that means there will probably be another ultrasound before the end of this pregnancy. Perhaps she will cooperate next time! Everything else was good. Her heart rate is 147, which is in the normal range. Yesterday, I wrote about my itchy skin, and my doctor ordered a blood test today because this could be an indicator of liver function problems. However, I gained a whopping 6 lbs this month, which is about 40% of my total weight gain, so I'm guessing my skin is just stretching! I assume this was just a regular sonogram? Are y'all going to do a 3D sonogram? I don't know that we are. I think they're kind of cool, but Brian is creeped out by them! Great news Avery is so healthy :) I can't wait to see you at your shower!